The endemic woody plants largely occur in stream and river forests. They tend to be roughly confined to the lower 15 kilometres from the sea. The rivers exhibiting the greatest preponderance of endemics are, from the north, the Umzimkulwana, the Umtamvuna, the Mzamba, the Nyameni, the Mtentu, the Mzikaba, the Mkweni, the Lupatana, the Mlambomkulu, the Cutweni and the Mkosi. Grassland endemics are concentrated in the same geographical area but with only three areas of conservation; the remaining grasslands are historically subject to heavy utilisation. The conserved areas are the Mkambati Nature Reserve, the Oribi Gorge Nature Reserve (with little grassland) and the Umtamvuna Nature Reserve. Out side the conserved areas, the grasslands are somewhat depauperate in species diversity due to heavy grazing but still retain the essential components of the veldtype. In particular, the grazing lands contain plenty of refugia from pressure, such as wetlands, which retain a diverse biota. Preliminary survey in recent years has revealed many new species and given rise to the existence of the Pondoland Centre of Endemism. Much more research is required to complete a survey of this Centre and without doubt, further taxa await discovery. With the narrow distribution of many species, it is clear that any large construction such as a major road could well affect the viability of such small populations. Apodytes abbottii Potgieter & Van Wyk is a shrub or small tree normally occurring scattered in rock outcrops, less often it is found in kloof forest margins. It is well distributed throughout the Pondoland Centre. It is often seen with trees such as Canthium vanwykii and Loxostylis alata. Canthium vanywykii Tilney & Kok is a spreading shrub that is found in forest margins and bushclumps on rock outcrops. Its distribution is in lowland coastal forest around in southern KwaZulu-Natal and the northern Eastern Cape. Cussonia sp. nov. a small slender tree growing in south west facing krans scrub forest from the Umtamvuna River, Mnyameni River, Mkambati River and Mlambomkulu River. Colubrina nicholsonii Van Wyk & Schrire forms colonies of plants which have thick drooping stems. It often occurs on coastal stream banks but on Mt Sullivan it grows in greater numbers than elsewhere. Although flowering profusely, only a few fruits have been seen and no seedlings have ever been recorded; further survey of Mt Sullivan might reveal some regeneration. The type locality is the Daza River in Mkambati Game Reserve. It occurs from the south bank of the Umtamvuna River to Mount Sullivan. Recently located in Vernon Crookes Nature Reserve. Cussonia sp nov A small tree up to 3 m. It occurs in forest along south and southwest facing kranses in cooler, shady conditions. So far known from Waterfall Bluff, Mkambati River, Mnyameni River, Mzamba River and Umtamvuna River. Cyphostemma rubroglandulosum Retief & Van Wyk is a creeper and has been recorded in forests of the Pondoland Centre from the coast to higher altitudes inland. Dahlgrenodendron natalense J.J.M. v.d. Merwe & Van Wyk is a tall tree of the coastal lowland forests with a tendency to produce suckers. Although it fruits rarely, the seed is fertile and grows readily. However, so far no seedlings have been noted in the wild. It occurs from the Mzikaba River to the Umtamvuna River with several relictual occurrences as far north as Ngoye Forest although it has never been recollected there. A good stand grows on the south west flank of the Ozwatini Plateau lying to the west of Ndwedwe inland of Durban. Erica sp. nov. A shrub normally found on cliffs, formerly included in Erica caffra. Eugenia erythrophylla Strey is medium to tall forest tree which occurs in coastal lowland forests particularly in small tongues of kloof forest. Its distribution is small in throughout the Pondoland Centre. Eugenia simii Duemmer is a small shrub that grows on coastal stream and river beds and banks. Its associates are Gymnosporia bachmannii and Syzygium pondoense. It occurs in southern KwaZulu-Natal and northern Pondoland. Eugenia umtamvunensis Van Wyk is a rare, small tree or shrub of very narrow distribution around the KwaZulu-Natal Eastern Cape border. It grows on kloof and krans forest margins near the coast. It ranges from the Mtentu River to the Umtamvuna River. Eugenia verdoorniae Van Wyk grows more often as a shrub than a small tree. This narrow leafed plant grows on coastal kloof and krans forest margins confined to the area from southern KwaZulu-Natal and Pondoland north of Fraser’s Gorge. Eugenia sp. nov. A is a slender small tree occurring in dry forest. It has a scattered distribution in KwaZulu-Natal. Eugenia sp. nov. B is a small robust tree occurring on sandstone kranses and dry forest in the lower half of KwaZulu-Natal. Eugenia sp. nov. C is a medium tall forest tree marked by its flush of new leaf in reds, pinks and greens. It occurs in coastal lowland forest in southern KwaZulu-Natal and Eastern Cape. Grewia pondoensis Burret is very close to Grewia occidentalis but differs in its thick glossy leaves and its lax habit. Another species of coastal lowland forests in southern KwaZulu-Natal and northern Eastern Cape. Gymnosporia bachmannii Loes. is a small shrub seldom growing more than one metre tall. It only grows in rocky stream and riverbeds in coastal KwaZulu-Natal/Eastern Cape border area. Gymnosporia vanwykii R.H. Archer is a rare geoxylic suffrutex of the grassland which occurs along the southern KwaZulu-Natal and Eastern Cape coast. Indigofera braamtonyi ined. Schrire resembles I. natalensis but has a very limited distribution with an strange outlier at Ngoye Forest. Indigofera jucunda Schrire grows along many of the sandstone streams. This shrub is very popular in gardens with its long lasting pink flower spikes. Ipomoea sp. nov. is a tiny geophyte seen only twice, once in Mkmabati Nature Reserve and once on the Mnyameni River. It grows in the shallow Selaginella fern beds on flat rocks gardens. Jubaeaopsis caffra Becc. This palm is renowned world wide for its strange occurrence on the northern banks of only the Mzikaba and Mtentu Rivers at the coast. It has been widely cultivated by palm growers. Leucadendron pondoense Van Wyk is a fire escape tree up to six metres tall that grows in streambeds above the coast ranging from Nyameni River in the north to Mlambomkulu River in the south. In this range it occurs in last five or six kilometres from the sea. There seems to be no reason why this plant does not occur in the streams outside this range but still within the Pondoland Centre. Lydenburgia abbottii (A.E. Van Wyk & Prins) Y. Steenkamp, A.E. Van Wyk & Prins. is a tall forest tree of upwards of 30 metres which occurs in coastal kloof forests. It is the most rare tree in South Africa. In steep land it grows with a single erect stem while in flatter places it may have several stems. From known records, it occurs from Amphitheatre in the Umtamvuna Nature Reserve to the Mzamba River, a total range of only 10 kilometres. It flowers profusely and the seeds are quite viable. This is the most closely confined distribution of the endemic woody plants of the Pondoland Centre and development could easily destroy the viability of the population. The total population is estimated to be between 200 and 400 specimens. Manilkara nicholsonii Van Wyk is a medium tree of coastal lowland forests in KwaZulu-Natal and Eastern Cape border. It occurs as a scattered member of both mesic and dryer forests. It has an extremely low fruit set as a gall-forming insect attacks the flowers. Maytenus abbottii Van Wyk is a small colonial tree that favours the moister places including stream banks in coastal lowland forest. A small distribution around the KwaZulu-Natal/Eastern Cape border. Maytenus oleosa Van Wyk & Archer is a rare, small riverine tree of limited coastal distribution around the KwaZulu-Natal/Eastern Cape border. It used to be included in M. undata but its clearly defined habit and habitat marked it out. Ochna sp. nov. is well distributed along sandstone streams in lowland coastal forest and has been included in O. natalitia. Phylica natalensis Pillans is an extremely rare subshrub known only from the area around Port Edward. It forms small clumps in grassland. The largest known population occurs in the vicinity of the Red Desert. Pseudosalacia streyi Codd is a tree that grows within close proximity of streams and occurs in pure stands. There is a single group that grows high up under the cliff above a gorge where it seems that the moisture regime is similar to stream margins. A rare plant that occurs in groups isolated from each other. It occurs in coastal lowland forests around the KwaZulu-Natal/Eastern Cape border. Pseudoscolopia polyantha Gilg is a small shrub of coastal lowland forest that occurs along forest margins in colonies. Although mainly confined to the Pondoland Centre, there are outlying populations on the Great Noodsberg and at Porterville in the Western Cape. A remarkable distribution. Putterlickia retrospinosa Van Wyk & Mostert is a spiny creeper of forest and forest margins. 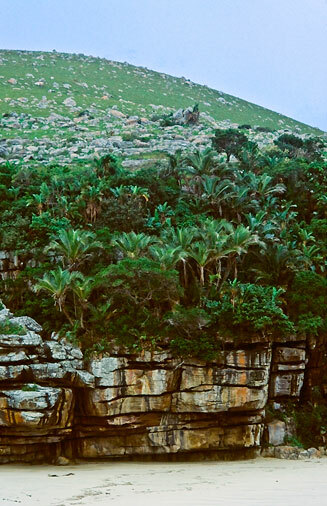 It occurs coastal lowland forest around the KwaZulu-Natal/Eastern Cape border throughout the Pondoland Centre. Raspalia trigyna (Schltr.) Duemmer, the only species in the family Bruniaceae to occur outside the winter rainfall area, has had a very chequered career in recent times. It is the most rare shrub of the summer rainfall region of South Africa. From 1965 it was known from a single specimen in the Umtamvuna Nature Reserve until that plant died in 1988. That year a survey was conducted to search for other wild plants and resulted in the discovery of a single plant at Magwa Falls. This plant was successfully propagated and five clones were planted in the Umtamvuna Nature Reserve of which four survive and are healthy. Another five clones were handed to the then Transkei Department of Agriculture but recent investigations have failed to reveal their whereabouts. 1n 1995, a further wild specimen was discovered in the Umtamvuna Nature Reserve and efforts are currently under way to cross breed this and the clones - so far unsuccessfully. In 2001, a tiny breeding colony was found in Pondoland; this amazing discovery serves to emphasize the vulnerability due to the minute 40 square metre colony. Rinorea domatiosa Van Wyk is a small tree that occurs in colonies in lowland coastal forest. It is very closely allied to Rinorea angustifolia (Thouars) Baill. but does not grow together with it. Rhus acocksii Moffett is a slender spiny creeper of coastal lowland forest margins of the Pondoland Centre. Rhynchocalyx lawsonioides Oliv. is a small tree of coastal lowland forests which grows in colonies on kranses and along streams. Its range is southern KwaZulu-Natal and northern Eastern Cape. Syzygium pondoense Engl. is an attractive robust shrub of stream and river banks and beds. It occurs in southern KwaZulu-Natal and south to the Mlambomkulu River in Eastern Cape on sandstone streams close to the coast. Tephrosia pondoensis (Codd) Schrire is a small slender tree or shrub that occurs in forest margins. Its occurrence is very limited and there are many seemingly identical forest margins where it does not appear. Tricalysia africana (Sim) Robbrecht a rare small tree of lowland forest near Magwa Falls. Euryops leiocarpus (DC.) B. Nord. Plectranthus oertendahlii Th. Fr. Jr.
Syncolostemon ramulosus E. Mey. Ex Benth. This list clearly shows the need for further research of the biota of the Pondoland Centre. Senecio erubescens Ait. var. incisus DC.